These Baked Pancakes With Spiced Apples are a fluffy custard like pancake with diced apples simmered in ground cloves, ground cinnamon, and the juice of the fruit itself fool your taste buds into an apple pie experience. The dutch baby pancake batter borders on custard pie, enveloping the apples into the honey-sweetened folds of creamy, fluffy pancake. Also, wow. 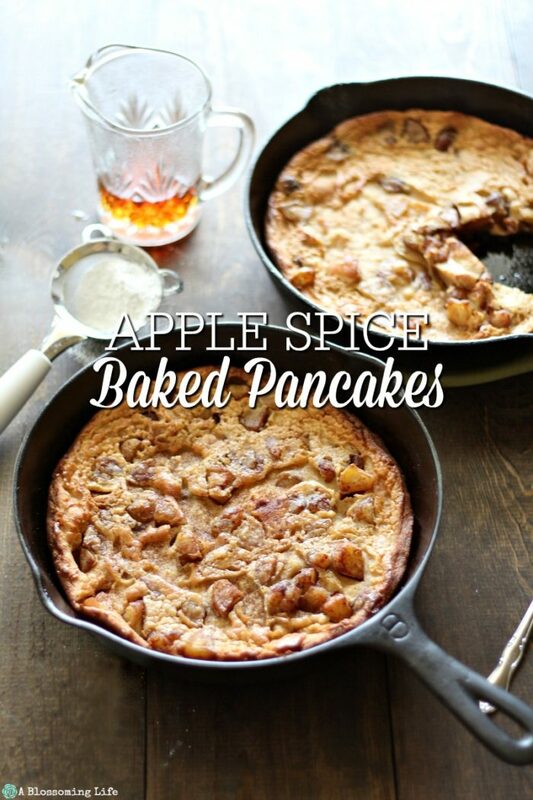 The smell of the simmering apples, followed by the baked pancakes baking in the oven, create an aromatic blend fitting for fall. We loved this dish, and we hope you do, too! For this recipe you will need: apples, coconut oil, cloves, cinnamon, flour, milk, eggs, honey (or maple syrup), vanilla, and salt. Allow me to join the rest of the world as I express my surprise at the sudden arrival of the next season. How is fall already here?! I know that I literally say that every year. The arrival of fall and end of summer spark a rivalry of emotions within me. I’ll miss the warmth (moisture-laden, scorching heat) of our southern Illinois summer, but the excitement of chilly air, crisp blue skies, copper and gold leaves, and warm food and drinks – a fresh new season of life – outweighs the apprehension that often accompanies change. Summer lasts just long enough, I think, and fall arrives just in time. God appointed them perfectly. So, while a handful of late-summer posts may continue to trickle in, we recognize September for what it is: the unofficial, we-cant-hold-off-any-longer, pumpkin-flavored dawning of all things fall. We love breakfast around here. We also love dessert. Anything that merges breakfast and dessert earns a place next to my cup of coffee at the kitchen table. This recipe does just that. Overall, these apple spice baked pancakes boasts a simple sweetness, focusing on the natural sugar and tartness of the fruit, and the creaminess of the egg custard. 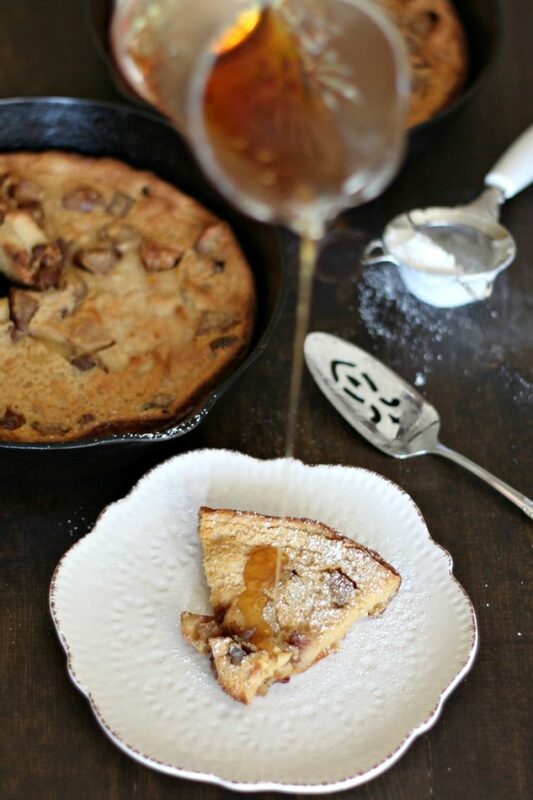 It easily pairs with a dusting of powdered sugar or a drizzle of quality maple syrup. Tools you may need: cast iron skillets, mixing bowls, blender or mixer (we used this hand mixer), measuring cups, measuring spoons, and liquid measuring cup. Silicone spatulas are also very handy. How Do You Make Baked Pancakes? 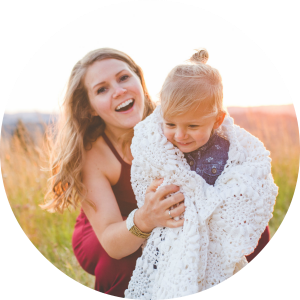 I’m so glad you asked… here is a simple how to video on how to do it. If you rather just read them then jump below the video. For the fruit, split the coconut oil between your two, 10-inch, cast iron skillets. Mix the diced apples (I take most of the peel off), ground cloves, and ground cinnamon, then add them to the skillets. Cook the apples on the stove top over medium heat, stirring often until they begin to soften and the juices are bubbling. While they cook, begin working on the batter. For the batter, add the milk, eggs, honey, and vanilla in a mixing bowl and combine well (you could also use a blender). Mix in the flour & salt. When the apples are tender and bubbling, remove your cast iron skillets from the stove top and add the rest of the coconut oil to the apple mixtures (1/4 cup per skillet). Spread apples and oil around evenly. Pour your batter evenly into each skillet, over the apples, and return to the oven. Bake for approximately 20 minutes, or until golden. Serve with a drizzle of real maple syrup or a dusting of powdered sugar. Use your blender, hand mixer, or whisk. The method is your choice – just blend well! Use your favorite milk of choice. I’ve used coconut milk with perfect results. The recipe calls for coconut oil, but use butter if you prefer! Yum! This recipe will make two, 10-inch, cast iron frying pans or one 9×13 baking dish. If you make one large pancake the cook time may be longer. Keep in mind that a flour with a heavy or very gritty consistency may not provide the same results. All purpose flour is my preferred. Other fruits are delicious, like this blueberry dutch baby pancake, or leave the fruit out and you’ll have a deliciously vanilla, custard pancake. 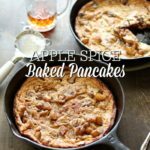 These easy apple spiced baked pancakes is an simple breakfast perfect for the Christmas morning, or just to celebrate fall. If you try this recipe and love it. Please give it 5 stars and leave a comment! Diced apples simmered in ground cloves, ground cinnamon, and the juice of the fruit itself fool your taste buds into an apple pie experience. The pancake batter borders on custard pie, enveloping the apples into the honey-sweetened folds of creamy, fluffy pancake. For the batter, add the milk, eggs, honey, and vanilla in a mixing bowl and combine well. Mix in the flour & salt. - Use your blender, hand mixer, or whisk. The method is your choice - just blend well! - I've used coconut milk with perfect results! - I used coconut oil, but use real butter, if you prefer! Yum! - This recipe will make two, 10-inch, cast iron frying pans or one 9x13 baking dish. - Keep in mind that a flour with a heavy or very gritty consistency may not provide the same results. - Other fruits are delicious, too, or leave the fruit out and you'll have a deliciously vanilla, custard pancake. These look tasty. I love the twist on pancakes you’ve given to this recipe. Pinning. Thanks for sharing at Snickerdoodle.